Once upon a time a group of food bloggers got to talking and thought it would be fun to do a cookie swap (because who doesn’t love cookies?). And so, the Coast to Coast Cookie Swap was born. After much deliberation, I decided to make loaded oatmeal cookies. 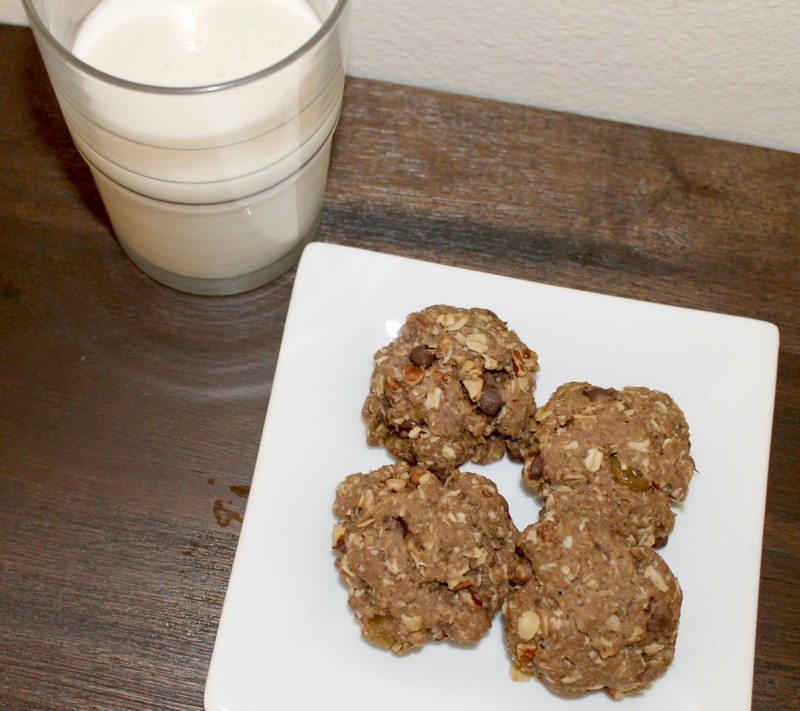 The idea for the loaded oatmeal cookies came from the Starbucks Outrageous Oatmeal Cookie. Every time I go to Starbucks I eye that cookie, but after finding out it had soybean oil in the ingredients, I realized I would have to make my own “outrageous” oatmeal cookie if you will. For Christmas I made Chocolate Oatmeal Pecan Cookies for my swap with Natalie, so this time I thought I’d take it a step further and make a loaded oatmeal cookie with all sorts of fun things like raisins and nuts. As you can tell from my chicken scratch, I was a bit undecided on what exactly I wanted in the cookies. This recipe yields about 40 cookies, so if you don’t want to make as many then I recommend cutting the recipe in half. 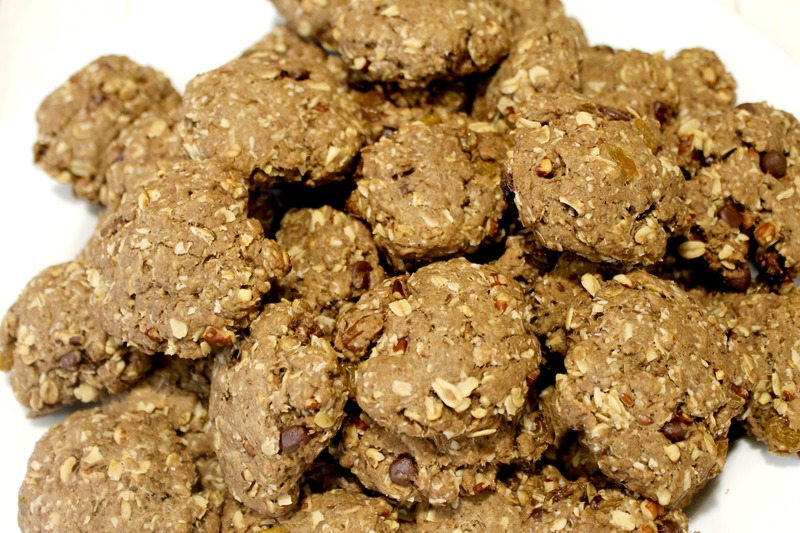 These cookies also taste great frozen or with a glass of almond milk! I’m so glad that we did the Coast to Coast Cookie Swap! It was the perfect opportunity for me to make some delicious loaded oatmeal cookies as well as try other treats from my wonderful food blogger friends! 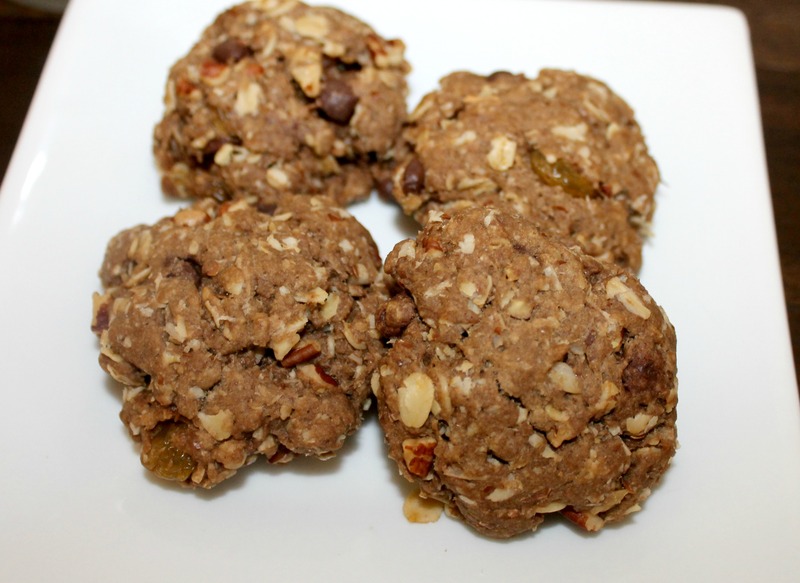 And below you can find the recipe for my loaded oatmeal cookies! Preheat your oven to 350F. Lightly grease two baking sheets with cooking spray or line with parchment paper. In a mixing bowl blend your flour, ground flaxseed baking powder, baking soda and oats and set aside. Using a stand mixer or a hand mixer (or you can whisk by hand) beat your coconut oil until creamy and begin to fold in your maple syrup. Add your eggs one at a time and continue to mix until well blended. Add your milk, vanilla and salt to your wet mixture and then slowly fold in your dry ingredients. Lastly add the chopped pecans, raisins, coconut and chocolate chips and continue to mix until everything is nicely combined. Scoop spoonfuls of dough onto the baking sheet and flatten. Place cookies in the oven and bake for 12-15 minutes or until the bottoms are lightly browned. Remove cookies from oven and let cool, then enjoy! 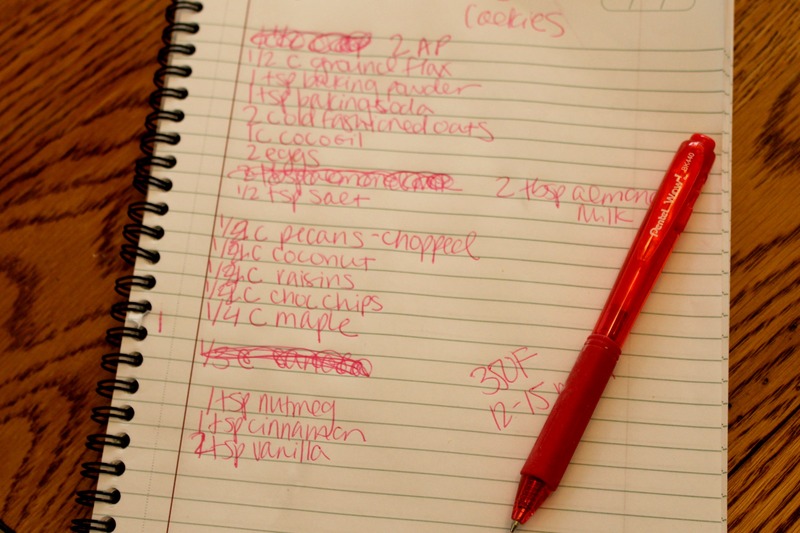 What’s your favorite cookie recipe? Share in the comments! This entry was posted in Baking, Food Bloggers, Good Eats and tagged chocolate, cookie on April 6, 2014 by allie@sweetpotatobites. Sooo fun! Can’t wait to do it again! Next time I’m making biscotti for sure! I’m so glad we did this! Thank you for the Loaded Oatmeal Cookies; I shared them with friends and we couldn’t get enough! Those are loaded cookies, wow! They sound great. I don’t bake often…the last cookies I made were brown butter snickerdoodles at Christmas time! I hadn’t really baked since December either (cookie overload) so it was nice to get back at it!